[Alex] wanted to play video games with an arcade stick and buttons, but got sticker shock after seeing the price of commercially available controllers that connect to a computer via USB. He set out to build his own and ended up with the controller-in-a box that you see above. At first he tried using an mbed microcontroller board but was unhappy with the latency built into the system that detected a button press, sent it via USB as a keyboard press, which was then interpreted as input by the game. He ditched the microcontroller completely and picked up a couple of 4021 parallel-to-serial shift registers. 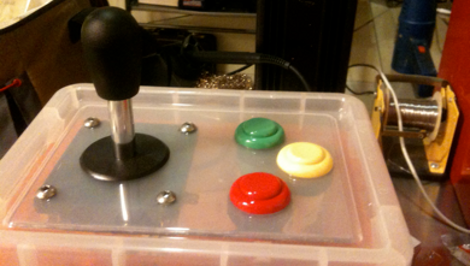 He had previously used this method to make his own SNES controller. The SNES uses two 8-bit shift registers to generate an 16-bit serial packet to send to the console. [Alex’s] reused that system, adding an SNES controller plug to his arcade box, and using the SNES to USB converter he already had to connect to the computer. Now he’s got a portable controller for the cost of three buttons, the stick, and two IC’s. He explains the project himself in the clip after the break. I built one out of wood, controllers from Happ Controls and an ‘iPac’ board. Then ten years later I took it all to bits and used most of it to improve a JAMMA cab I now own that has some sort of crazy modified PC inside it. That’s a Really Useful Box! I haven’t played on a proper old-school arcade machine with microswitch buttons in many many years, control pads have taken over the world and it’s understandable to see why when you count the number of buttons & sticks an average pad has to control the modern day games. Is Mr. Clark voluntering to write the code? Please post! I work as a tech at a Boomer’s Arcade, and have access to all sorts of arcade game stuff, from buttons to joysticks and everything inbetween. When ever they decommission a cabinet, if the stuff is over 10 years old or useless in something else (like, the buttons we had in Dynamite Cop – for instance – don’t fit many of the sockets we have on other games correctly) the staff gets free grabs on it. That being said, I think the next time we send a game to the graveyard, I’m going to put one of these together! Tupperware doesn’t seem to be all that sturdy? That’s not your average tupperware box, it’s a Really Useful Box. I have a stack of the 3 litre ones and they are very sturdy, their only letdown is they could’ve made better carry handles. #2) but i dont see how this is uC-less. maybe im just clueless, but he used a uC-project he already had. on hand right? “using the SNES to USB converter” … equates to: used a uC to convert the signals. but still, great job! & using a sNES connector makes the usb-BS (think drivers) the users’s problem, for which they ALREADY have the users manual and CD! PS: already have cheating combo-moves in DOOM/SKULLTAG FTW! i know its offtopic but to all those haters back then about the HAD article on using an IDE port to program an AVR,,, you haters say it is so religiously immoral to use an IDE port for programming an AVR… its called a hobby, get over to it. apparently your hobby is commenting on websites that you have no buisness reading seeing as you only want to discourage people from having FUN with used electronic parts that were free, well, at least the non-AVR parts. WE WILL NOT STOP when you tell us to! @STAFF please please PLEASE for the sake of this falling-apart community, if someone says its imoral or threatens death because someone had fun learning electronics using free off-the-curb parts, BAN THEM! this website is called Hack.A.Day. !!! HAD has implemented some changes addressing that problem and as far as I can tell, the overall tone of HAD comments have gotten more positive. HAD Staff: Might be a good idea to figure out a way to let commenters know some ground rules down here in the comment area and perhaps provide a link to your “cleaning up” policy. and thats the way you do it! Spoofing a keyboard button press over USB shouldn’t have any more latency than emulating an SNES controller and sending it over USB. Was the code for the mbed poorly written, or am I missing something? Most good USB keyboards nowadays don’t have a maximum button press issue – look at Das Keyboard etc etc. Your information was relevant a decade ago, but not now. I’ve made these with parts from Happ in a solid oak box (painted lacquer black). I like to use cheap controller. Wire the microswitches on the buttons and stick to the controller PCB contacts. We used o throw the crappiest $5 controller in there, and it worked like a dream. I used to like to use PSX controllers, since they were adaptable to just about any other platform. I’m doing something very similar at home right now. I plan on using my original xbox in a mini-arcade cabinet for my kids to play. I bought a used original xbox controller for $7 last weekend and I’m ordering the stick and buttons soon. I plan on tying the stick and buttons in to the pads on the xbox controller and then just plugging the controller into the port on the xbox. Also, I hacked the xbox so I can also play emulators on it in addition to original xbox games. Heh we did this on the Amiga with shoe boxes and duct tape 20 years ago! I did a Genesis pad to USB converter with a Teensy++ and didn’t meet serious latency problems but perhaps I’m not a good player lol. As Teensy virtual keyboard driver has a 6 simultaneous key limitation, I used the virtaul joystick emulation. To those of you doubting the durability of a tupperware controller, I want to mention that I built a beatmania IIDX controller out of cardboard about a year ago, and it has held up fine.